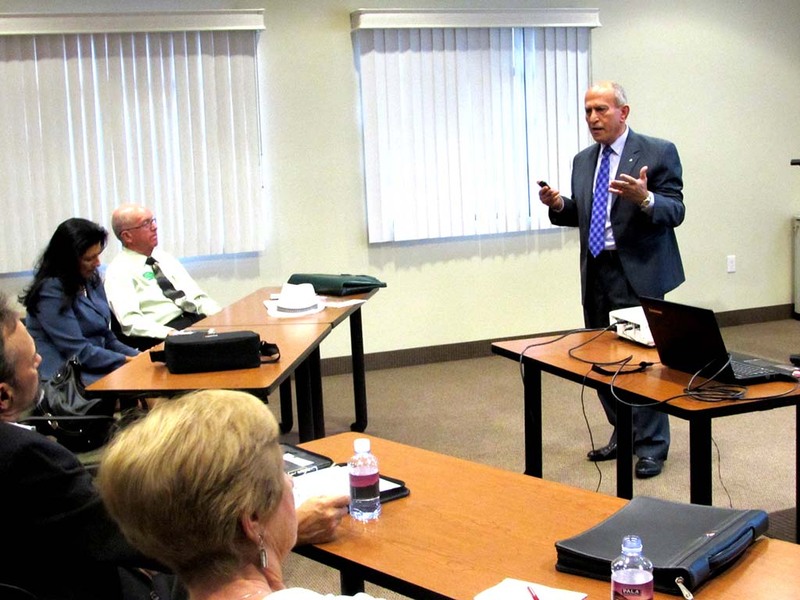 ESCONDIDO—Mayor Sam Abed gave a presentation Jan. 6 to the Escondido Chamber of Commerce to meet with local business leaders and discuss his goals for the new term. He plans to focus on four major priorities, financial management, economic growth, neighborhood improvement and public safety. He also spoke about his election success. He said getting nearly 60 percent of the vote was both humbling and rewarding, although it wasn’t easy. “All of the hard work by myself, my colleagues on city council and our staff pays off,” Abed said. He said he spent $25,000 on polling, which helped him narrow down important issues with the voters. “Illegal immigration was (second most important), did our opponents know that? I don’t think they had a clue what was going on,” Abed said. The polling helped him target specific areas by issue with mailers. The polling showed him who cared about what and where. It was broken down by council district, gender and ethnicity. His polls found the most important issue to be jobs in the city and the economy. Abed said he was pleased with the election results although considered the failure of Proposition G a loss. Prop. G would have made Escondido a charter city if it had passed. He blamed its loss on bad luck. The mayor considered the failure of Proposition H a huge success. Prop. H would have made it possible for developer Michael Schlesinger to build up to 430 homes on the defunct Escondido Country Club. Schlesinger hoped the residents would see his proposed development as a compromise since it offered public amenities like a recreation center, pool and trails for use by all residents. Abed said his neutral stance on Prop. H helped him get 50 percent of the democratic vote from residents surrounding the country club. In the past, Abed supported turning the country club into permanent designated open space. Councilwoman Diaz, who ran against Abed, supported Prop. H as a compromise that would avoid costly litigation. “Siaw was hired by Schlesinger’s buddies to screw up the election and be vindictive,” Abed said. Schlesinger didn’t respond to the Siaw comment but said focusing on the past won’t help come to a positive future. “It’s now time for all of us to put our past differences behind us and work together to find the best way to develop the former country club site that is consistent with the existing neighborhood. Rehashing the bumps and grinds of a political campaign that ended more than two months ago does not contribute to that process,” Schlesinger said. Schlesinger and the city are still in court but he and the mayor hope to come to a compromise that works for all of the residents in the city. The hearing will be held Feb. 26. Abed also talked about campaign spending. Abed said he and Diaz each spent about $175,000, although he raised $100,000 more. He believed he spent his campaign funds more wisely with the targeted mailers. He was disappointed by the Latino voter turnout, with about 33 percent of registered Latinos voting. He went on to say that people shouldn’t come to city council complaining about not having enough representation. In the next election, Abed hopes there will be a Hispanic candidate in District 3 to represent the community.